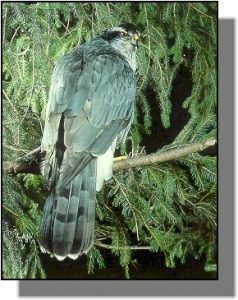 Comments: The northern goshawk is the largest raptor found in coniferous woodlands. It is a fast, skilled flyer and can weave through the forest with amazing agility. With a fierce disposition, it is willing to take on the most challenging prey. Goshawks are handsome birds with slate-gray backs and light-gray breasts with fine horizontal barring. They have a distinct white supercilium or eyebrow, and by their fourth year their eyes are dark red. Distribution: In North America, goshawks inhabit conifer dominated mixed woodlands from Alaska, through Canada into the mountains of western United States and Mexico. Many are resident in their breeding territories but a few will migrate southward for winters. When Rocky Mountain grouse and hare populations crash some birds must move into other areas to find food, including the Great Plains. The northern goshawk is a rare winter visitor to Kansas but there are scattered records throughout the state. Food: Goshawks are powerful, aggressive predators that take ptarmigan, grouse, rodents, hares, rabbits, squirrels and medium-sized birds. They mainly hunt from a perch but will chase persistently when necessary.